Methane releases in the Arctic can lead to abrupt local warming that triggers further methane releases. The amount of methane stored in hydrates is huge and release of even a small part of the methane in hydrates could lead to runaway global warming. The image displayed on the left shows that methane’s global warming potential (GWP) is more than 130 times that of carbon dioxide over a period of ten years. The image featured in a video and poster produced by Sam Carana1 (2012a). IPCC2 figures were used to create the blue line. The red line is based on figures in a study by Shindell et al.3, which are higher as they include more effects. This study concludes that methane’s GWP would likely be further increased when including ecosystem responses. Ecosystem responses can be particularly strong in the Arctic. As mentioned on the poster, further warming in the Arctic can cause accelerated ice loss and trigger further releases of methane from sediments under the sea. 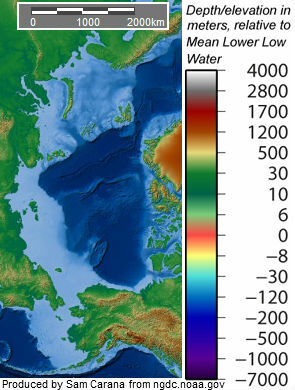 Release of methane from sediments is particularly worrying in areas such as the East Siberian Arctic Shelf (ESAS), where the sea is rather shallow (image below), causing much of the methane to enter the atmosphere without being oxidized in the water. Furthermore, low water temperatures and long sea currents in the Arctic Ocean are not very friendly toward bacteria that might otherwise break down methane in the water. As said, release of methane from sediments is particularly worrying in the Arctic, where much of the water is rather shallow, as illustrated on the image below. This is the case for areas such as the East Siberian Arctic Shelf (ESAS) that contain huge amounts of methane in the form of free gas in sediments and in hydrates. As said, Shindell’s GWP figures do not include all indirect effects. Accelerated loss of sea ice and weakening of methane stores, due to the additional local warming of methane locally, can have a dramatic impact in case of large abrupt methane release in the Arctic. Such local warming can cause accelerated loss of the amount of snow and ice and of its capacity to reflect sunlight back into space, causing further warming, in a vicious circle of feedbacks. 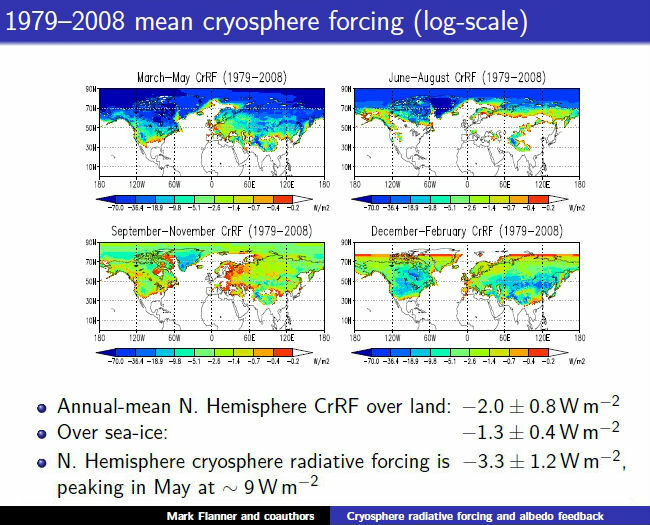 The images below are from Flanner4 (2011) and shows that ice in the Arctic can cool areas by more than 30 Watts per square meter, and in summer by up to 70 Watts per square meter. Apart from decline of snow and ice, additional methane releases could also dramatically increase accelerate local warming. The potential amount of methane estimated by Shakhova et al. 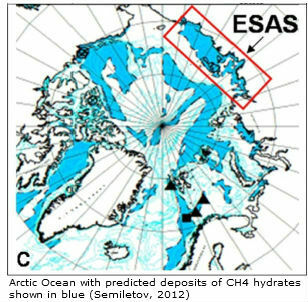 are 1700 Gt5 in the ESAS (image left) alone, in the form of methane in hydrates and as free gas, with further carbon contained in permafrost that may be released as methane as the frozen soil and lakes melt. Some 50 Gt6 is ready for abrupt release at any time in the East Siberian Arctic Shelf area (ESAS) alone (image left, from Semiletov7, 2012). The image below, from Sam Carana8 (2011), illustrates the danger of the situation in the Arctic, where high levels of greenhouse gases, combined with the impact of aerosols such as soot, can cause high summer temperature peaks. High temperatures in the Arctic will speed up loss of sea ice, resulting in even further warming that weakens stores of methane in the form of hydrates and free gas in sediments under the water, in a vicious cycle that threatens to lead to runaway global warming. The IPCC2 rates methane’s Radiative Efficiency (in W m–2 ppb–1) at 3.7 x 10–4 and gives methane a perturbation lifetime of 12 years9. The IPCC9 defines perturbation time as the time it takes for a perturbation to be reduced to 37% of its initial amount. At the same time, the IPCC10 gives methane a global mean atmospheric lifetime of 8.4 years, which is the time it takes for half a perturbation to be broken down. Methane’s lifetime will be extended as the burden rises, due to hydroxyl depletion. 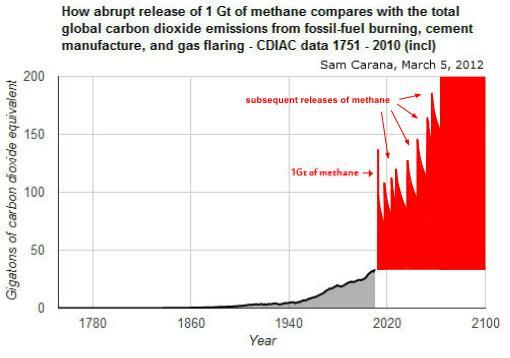 The IPCC11 estimates that this methane feedback effect amplifies the climate forcing of an addition of methane to the current atmosphere by lengthening the perturbation lifetime relative to the global atmospheric lifetime of methane by a factor of 1.4. A NASA12 (2009) article discussing Shindell’s work mentions that increases in global methane emissions have caused a 26% decrease in hydroxyl. Prather et al.13 (2012) derive a present-day atmospheric lifetime for methane (CH4) of 9.1 years. Methane is typically released gradually around the world, allowing much of the methane to be oxidized swiftly by hydroxyl in the tropics. In case of large abrupt releases of methane in the Arctic, much of the methane may persist there for decades and thus amplify local warming dramatically. This is the case because the methane originated in one location, unlike other types of methane releases that occur gradually around the world. There is very little hydroxyl present in the Arctic atmosphere, as illustrated by the image left, from Taraborelli et al.14 (2012). The little bit of hydroxyl that is present in the Arctic atmosphere will soon be depleted in case of large abrupt releases. While the methane will eventually spread around the world, this will take time. Nesbit15 (2002) mentions that a major methane release in the high Arctic would take 15-40 years to spread to the South Pole. Abrupt releases in the Arctic could thus cause dramatic local warming, while lack of hydroxyl in the Arctic could further make Arctic methane stay there for decades, with a high LWP, threatening to trigger further methane releases. 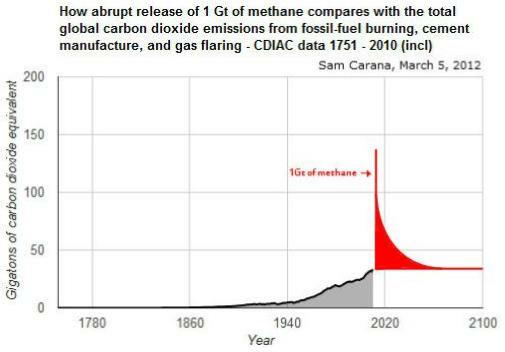 What would the impact be of abrupt release of 1Gt of methane in the Arctic, compared to the total global carbon dioxide emissions from fossil-fuel burning, cement manufacture, and gas flaring? The image below, from Sam Carana16 (2012b), gives a rather conservative impact, showing a rapid decline toward a small residual impact as carbon dioxide. However, above graph does not include the indirect effect of triggering further releases. This is especially a threat in the Arctic, given the large presence of methane, the accelerated warming, the little oxidation that takes place in the Arctic atmosphere, and the time it will take for abruptly released methane to spread away from the Arctic. The additional warming that this will cause in the Arctic will make the sea ice decline even more dramatically than is already the case now. The combined impact of sea ice loss and methane is huge, and threatens to trigger further releases of methane in the Arctic, with their joint impact accumulating as illustrated in the image below, also from Sam Carana16 (2012b). 3. Drew Shindell et al. (2009), Improved Attribution of Climate Forcing to Emissions. 4. M. G. Flanner et al. 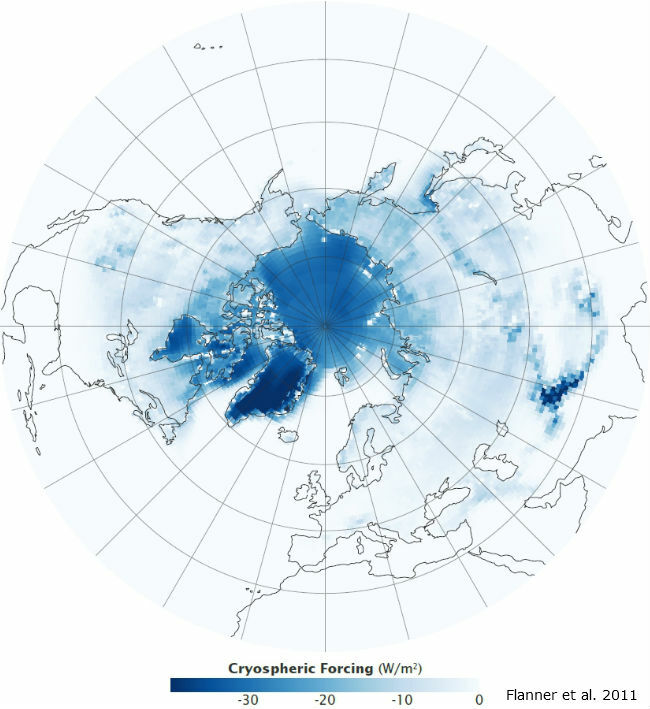 (2011), Radiative forcing and albedo feedback from the Northern Hemisphere cryosphere between 1979 and 2008. 8. Sam Carana (2011), AMEG Poster at AGU 2011. 15. Euan G. Nisbet (2002), Have sudden large releases of methane from geological reservoirs occurred since the Last Glacial Maximum, and could such releases occur again? 16. Sam Carana (2012b), How much time is there left to act?